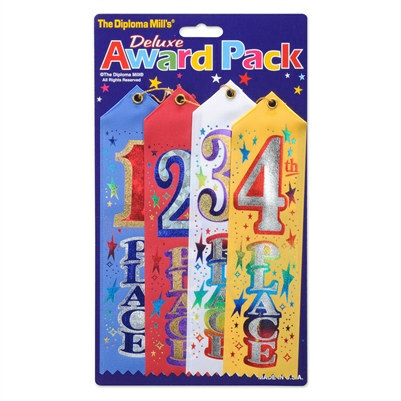 Now there's no need to buy single ribbons when you can buy this 1st, 2nd, 3rd, and 4th Place Award Pack. In this package you'll receive a 1st Place Award Ribbon, a 2nd Place Award Ribbon, a 3rd Place Award Ribbon, and a 4th Place Award Ribbon. Use this Award Ribbon package for a child's bike race, a science fair, field day, or for a classroom project. All of the ribbons have a brass grommet with gold string at the top of the ribbon for easy hanging. A Reward Card is attached to the back of the ribbon. We also have separate ribbon awards. You can take a look at the 1st Place Ribbon, the 2nd Place Ribbon, the 3rd Place Ribbon and the 4th Place Ribbon.